The importance of applying the correct video sync signal to your TV, monitor, scan converter, HDMI adaptor or projector. a how to guide to help you fix any issues you may encounter. Understanding your composite from your H/V and Sync On green type? Basic information on video sync timings, PAL, NTSC, CGA, EGA, VGA. sync occurs within the vertical blanking period. the horizontal and vertical sync signals play their part in creating the display you see. conversions, either a Y/C(S-video) or an RGB output is preferred. The sync is embedded with the video. literature states 60 Hz for NTSC. In practice, most of the time this 0.06Hz deviation makes no difference. So you have a retro game console or computer and you want to connect it to a modern LCD display or a projector, should be straightforward right? Composite video 1V Normally a yellow plug, contains video and a combined sync. Used by SCART inputs. CSYNC TTL (2-5V signal) Output by some graphics cards or a TTL signal from retro equipment. It only contains timing information, no video. HSYNC TTL (2-5V) signal Provides the horizontal video timing, which details the start and end of a line. VSYNC TTL (2-5V) signal Provides the vertical sync timing, which describes the frame rate. Sync-on-green 1V A -0.3V sync signal attached to a 0.7V peak green video signal. with a simple fix to the sync amplitude, by adding a series resistor on the sync signal. I show a TTL signal as a 2-5V signal, for good reason. A retro computer or video system will have 5V logic, a logic 1 output can be from 2.4V (min) to 5.5V(max). When you connect one of these signals to a 3.3V video chip, like that on the GBS-8200, you are damaging the device as the input signal exceeds the supply voltage. The ESD protection diodes conduct and soft of allow the system to work, but they are not meant to be used continuously and will fail, at the same time as your board. The next section details various methods of converting sync signals. So how do you convert a composite video to separate h/v sync or reduce a 5V TTL signal to 3.3V LVTTL or any or a number of options? though for all circuits shown, a simple linear regulator would suffice. circuits, based around commonly available sync separators, the most widely used being the National Semiconductor (now Texas Instruments) LM1881. They accept a composite video signal and strip the colour burst off the signal and in the case of the LM1881, output a 5V TTL CSYNC signal. Taken from the LM1881 datasheet. Widely used as it’s a readily available part in a DIP package. 1) The 5V TTL output is not compatible with modern TVs/HDMI adapters/projectors. It needs a level translator. 2) It does not provide a separate horizontal sync output. If your adaptor only needs CSYNC, great, otherwise try the Syncstripper2 circuit below. You may get away with using CSYNC for HSYNC but it is by no means guaranteed. display devices, no external converter needed. It provides true H/V and C sync outputs and works with a wider range of video types and frequencies. Would an adaptor board with this circuit, video amplifier and maybe a scanline generator be of interest? The second variant is for the GBS-8200 or a modern monitor that is not 5V tolerant. reduce the signal to be approximately 3.3V, we reduce the amplitude by 27-30%. An improvement is to use a transistor circuit. level translator for the Arduino, it is acceptable to use it for video. The circuit shown above has the option to use either an OR gate or an XOR gate to combine separate HSYNC and VSYNC into a CSYNC signal. family, you can use a 5V tolerant part, operating from a 3.3V supply. DON’T CONNECT 5V LOGIC TO MODERN MONITORS OR ADAPTORS! to around 3.9/4.0V, which you might think is OK. The clamping action distorts the signal and can cause the video display/adaptor to incorrectly sample the sync signal. will fail and when they do, the full 5V signal is fed into the IC. Depending on many factors, the distortion will get worse but one thing is 100% certain, the device will fail. available, providing your source produces a C sync signal. If you need to to combine H and V Sync, use the logic circuit shown above. If your system provides a composite video signal, use one of the sync strippers but ensure you condition the output to be 3.3V LVTTL compatible. systems it is not a definitive guide of what you must do. Sometimes you need to experiment, if you have an oscilloscope, make some measurements. I’ll be taking a break for a bit whilst I get busy with the CAD tools but I will read and respond to your comments. 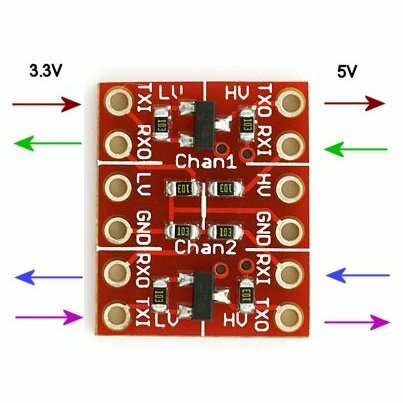 While the 5V could be find on the PSU, what is the best place to get 3.3V ? Buy an AMS1117-3.3 volt and send it 5V, it will give 3.3 on the other end, just make sure your 5V source has the right Amperage for the combined consumption. Hi. I’m trying to connect an atari STf to a pvm monitor. This model has no composit video, and while it’s still supposed to have sync on pin 2, it does not seem to work. I tried both a normal scart cable (that works with other ataris) as well as another identical cable and adding a 330 resistor to the sync cable, and nothing. I know the hsync and vsync signals are ok because the atari works fine with an atari sm124 monitor. If I want to get csync from hsync and vsync for this computer, can I use the circuit above? What real world components do I need and how do I power them? For a Sony PVM monitor, we could use the “OR/XOR sync combiner circuit” shown above. As the CRT Sony PVMS accept 5V TTL logic, we could use a standard TTL logic device, no need for level translation, which makes it easier. To realise the circuit you would need a 74LS32, 74LS86, 2-3 100nF ceramic decoupling capacitors, a toggle or slide switch, some veroboard/protoboard and some 33R resistors and some 1K resistors. You only need one of the 4 gates in each logic device, connect the un-used inputs via 1K resistors to +5V to stop them ringing and causing havoc later. Connect the 100nF capacitors across pins 7 and 14 of the 74LS32 and 74LS86 device. Oh and a 13 pin DIN plug. From what I remember of the Atari, the +12V supply is current limited with a resistor. Is there another way of tapping off +5V from the Atari? Thanks for your reply. Actually, just yesterday thorugh the atari forum someone had a great idea to check why All cables I tried did not work. To open up the Atari and check. It seems some units of the STF (mine among them) did not even have the CSYNC generating circuit components fitted!! The drawing/place for them is there, but not installed! I was told the components, and it should be a matter of just soldering the 2 diodes, 3 resistors and transistor in their place and I should then get the sync signal on pin 2 as “normal”! Do you still recommend I add the 300 resistor to the cable as per you revised diagram? I assume if I make a cable meant for a pvm , which will only use the R,G,B, comp/sync & audio cables (and the ground ones), that I don’t need/care about the other pins and extra components like othe resistors, diode and capacitor, for the other signals that a regukar scart for TV uses, right? Do I need a syncstripper in a component setup? I’m testing the gbs8220 with component for now, and with NTSC (ps2, Wii) it looks fine, with PAL (ps2) the image shows a little “trembling”. I tested an amiga modded gbs8200 that was running 5v into the sync for a few days before I read this blog and added a 680 ohm resistor. It has some jagged noise on the right side of the picture and ghosting around movement(especially noticeable near the cursor) but other wise is working ok. How would I know if it has been damaged? I am beginning to set up a project to the use old CRT technology to operate with modern digital sources such as Freeview and Roku. I am attempting to feed an old industrial CRT monitor with signals from these devices with the composite signal to create a kind of retro style TV with modern capabilities. I have found that the monitor has a standard 10 way keyed PCB edge connector and have found the pinouts on line. Applying a video signal to the pin 8 results in out-of-sync but correct contrast pictures, in fact you can identify text and logos displayed. The line frequency is right on the mark at 15.62 kHz, but the field timebase runs too slowly. I think that observing your article I need a TTL h and v sync stripper. Would sync stripper circuit 2 be the answer to my problems? What voltage supply is required? Sorry for the delay in replying, this got caught up in spam filter. Syncstripper 1 or 2 should work. Circuit #1 is easier and cheaper to test. What monitors are they? Most industrial monitors used separate H/V syncs so a sync stripper is a good starting point. How do you know the field timebase is too slow? A 3.3V or 5V supply should suffice for a sync stripper. I need to combine h&v to Csync. What real components are needed. 74ACH102 chip which a NOR gate. Is it suitable? You want either a 74HC32 (OR GATE) or a 74HC86 (XOR) gate. I’ve not heard of a 7hAHC102 (or other family variant). It is acutally 74AHC1G02W5-7. NOR gate 1 channel SOT-25 as the manufacturer says. It is the only ready made circuit available online. from http://kahr.us. I found one circuit scheme that uses 74ch86. But I have limited knowledge of how to build it.